Kasplat High Scores and Splat Performance! Devlog Update news - Kasplat! In this week's Kasplat Devlog we take a look at high score tracking, game stats, brand new powerups and the all important performance optimization. We hope you enjoy reading. Make sure to check out and follow our social media for more great Kasplat updates and gameplay! Welcome back to another Geekabye Games Devlog! Make sure to check out our Facebook, Twitter and Instagram to keep up with what's going on with Kasplat, and subscribe to our YouTube channel for more video updates and gameplay! We have an exciting Devlog for you this week, performance optimization! I know, awesome right? Maybe not so exciting, but incredibly important nonetheless and necessary if you want your balloons gliding smoothly across the screen and not jittering around in an abysmal display of low FPS. To spice things up, we also had some fun this week implementing new powerus, adding game stats and tracking scores so you can gloat to your friend when you smash their high score! This week we tackled the biggest culprit of performance issues in Kasplat, those juicy paint splats. If popping tons of balloons didn't already cause performance issues, pulling out the Paintball Gun or Super Soaker and lathering the screen in splats would certainly do the job. The answer? Batching. Batching is a bit of a technical term and can be done in an array of different ways, but the general gist is that batching objects lets you send them all to the GPU (Graphics processing unit) to be drawn on the screen in one go instead of drawing each object one at a time every single frame. The job this week was to get batching working with our splat sprites (images). This primarily involved combining all the splat images into a texture atlas (a big collage image that contains all the splat images). Then when it comes time to popping a balloon, you use the atlas as the displayed image and offset its coordinates so that only a small part of the atlas (one splat) is displayed on the splat object. Once this was done, out splats could all be drawn by the GPU in once go, drastically improving the performance of Kasplat. 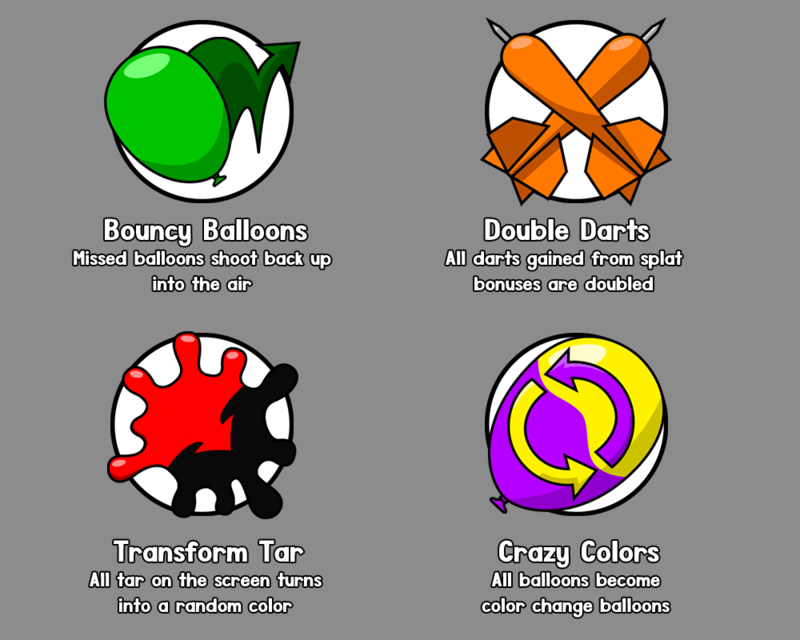 We also got some brand new powerups implemented this week, including; Bouncy Balloons, Crazy Colors, Double Darts and Transform Tar. Check out their brand new powerup icons and descriptions below. We can't wait to let you try them out! This week also saw a new feature added to Kasplat, stats! These stats aren't the boring ones you hear about in math class. At the end of a game, the player can tap on the stats button to see a breakdown of how they went that round including; score, game time, how many darts they used, what their highest scoring splat was and much more. Not only a great way to help you improve your game, but also a fun way to compete with friends and show em who the top popper is! That's it for this week's Devlog, thanks for coming and we hope you join us next week for more Kasplat development updates!